Issuing the results of a survey is an old trick for companies to try to gain free publicity in the media. Nestlé is today trying to bypass restrictions on advertising its SMA brand of infant formula with a press release campaign on mothers’ knowledge about breastfeeding and protein. It has recruited “media doctor” Dr Ellie Cannon who, according to her website, is “best known for her weekly health column in the Mail on Sunday and her regular appearance on Sky News Sunrise”. Nestlé’s marketing company is attempting to set up interviews with Dr Cannon to speak on the “changing protein composition of breast milk” as part of Nestlé’s new SMA PRO infant formula rollout. The press release does not mention the fact that Nestlé is relaunching its SMA formula as babies fed on the current product have “protein intake in excess of requirements”, according to information sent to health workers. The company, which is the target of a boycott for unethical baby milk marketing practices around the world, is trying to divert attention from this, while presenting itself as an expert on protein. In the meantime, supermarkets, such as Tesco, are desperately trying to clear their shelves of the current formula, which has led to a campaign in Parliament for formula marketing regulations to be enforced. The press release does not report on how many mothers buying SMA infant formula are aware that their babies have “protein intake in excess of requirements”, according to the latest information from Nestlé, but it is likely to be higher than 80% as Nestlé has only announced this to health workers. In an announcement to health workers in January 2016 it presented its “new improved” formula, claiming it has “protein profile closer to breast milk”. Nestlé has produced a SMA-branded video on protein and is working with parenting bloggers to promote it and drive traffic to its SMA Mums website, where the new SMA PRO infant formula is promoted. The Department of Health has asked the Trading Standards authority responsible for Nestlé to raise concerns over the campaign to clear existing stocks of formula from supermarkets. 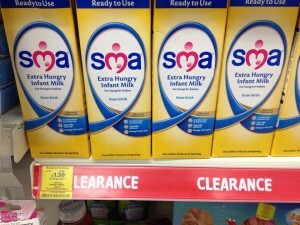 The Infant Formula and Follow-on Formula Regulations (2007) prohibit the special clearance displays and price cuts being used. The new formula is already on sale and some mother are reportedly concerned about “worrying effects” on their babies. A Facebook group has also been started by parents who find their babies are reacting badly to it. 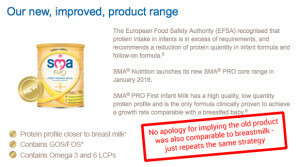 All brands of formula on the market have to meet composition requirements set in law and there is little actual difference between Nestlé’s SMA PRO and other formulas with regard to protein, according to the analysis by First Steps Nutrition. Companies are permitted to add additional ingredients, which are used for the basis of marketing claims, but have no proven benefit. There is no reason to choose one brand over another, except perhaps the preference of the child, and the price. Guides on formula for parents are available from the charity First Steps Nutrition. “This provides insight into how companies with a vested interest put their own experts into the media to speak about breastfeeding in a way that helps their product promotion strategy. Editors would do well to look instead to eminently qualified experts at independent charities and academic institutions. “This marketing campaign by press release shows Nestlé’s cynicism as it claims expertise to educate mothers on protein, while hiding the reasons for the clearance sale of its current formula. Until recently, it promoted this formula as the ‘closest to breastmilk’, but now says babies fed on it have ‘protein intake in excess of requirements’. “It is, of course, to be expected that a company tries to maximize profits, which is why parents require independent information on infant feeding. These self-serving marketing campaigns dressed up as ‘imparting knowledge’ are prohibited by international marketing standards – Article 5.5 of the International Code of Marketing of Breastmilk Substitutes is clear that companies should not seek direct or indirect contact with pregnant women and parents. Early Day Motion 1189 was published in Parliament on 3 March. It refers to the promotion of Nestlé SMA formula in Tesco and calls for marketing regulations to be enforce in this and other cases. Red Consultancy also worked to promote the SMA brand when it was owned by Pfizer/Wyeth. In 2012 it set up the SMA Baby Know How Road Show to target pregnant women and parents in shopping centres when a “new improved” formula was being launched at that time. Baby Milk Action ran a campaign alerting shopping centres to the misleading nature of the claims made and the international marketing standards being broken. Shopping centres pulled out of the events and the road show was cancelled. Nestlé, which completed its takeover of the SMA brand in December 2012, returned to a similar strategy in 2015, with street stalls promoting the SMA brand. Baby Milk Action won a case against Pfizer/Wyeth at the Advertising Standards Authority in 2012 for misleading advertising. The ASA ruled that the company could not substantiate suggestions that SMA follow-on formula is better than breastfeeding or other brands of formula. It is important to be aware that it is not just the total amount of protein that is important but the correct balance of amino acids in that protein for a baby’s body. The balance is different in human and cow’s milk. Reducing the total cow’s milk protein may reduce the marginal essential amino acids below that needed by a baby, even if the total stays above the total ingested through breastmilk. That is one reason why a baby needs more protein if from another source – to ensure enough of the marginal amino acids. The result of course is the waste of those present in excess of needs, and the strain on the infants metabolism and renal function excreting the waste. This has been understood for decades – don’t be hoodwinked now. Does the new formula have THE RIGHT BALANCE OF ESSENTIAL AMINO ACIDS? I also have a photo of the offending promotion in Tesco, dated 18.2.16 in Tesco Extra Yate.